When one thinks of the term "East meets West" it's usually some kind of Asian fare mixed with American (ie. bastardized) food that someone has thrown together to call it "fusion". Today the East is the East Coast and the West is West Africa. I used to be married to a West African man and had to learn traditional dishes and cooking techniques. The skills I learned are not to be forgotten and I shared my knowledge and stories with patrons at Best Health during my last cooking class. We made chicken yassa and cheebujen: all traditional dishes of the country of Senegal. Chicken yassa, also called poulet yassa, is a traditional Senegalese dish that is very popular and easy to make. A stew of meat or fish with onions, mustard, and olives, it is called poisson yassa when made with fish. 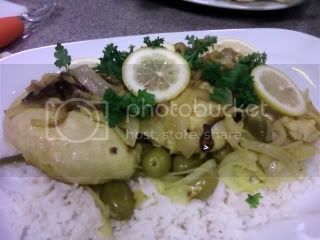 Back in 2008, I created this same dish with a twist: stuffed chicken yassa. In a large nonreactive bowl, prepare a marinade by mixing the lemon juice, mustard, onions, salt, pepper, minced chile, and 4 tablespoons of the oil in a large bowl. Place the chicken pieces in the marinade, making sure that they are all well covered. Cover the bowl and allow the chicken to marinate for at least 3 hours (overnight is best) in the refrigerator. Preheat the broiler. Remove the chicken pieces, reserving the marinade and onions, and place the chicken in a shallow pan. Broil the the chicken until it is lightly browned on both sides. Remove the onions from the marinade. Heat the remaining tablespoon of oil in a flameproof 5-quart casserole or Dutch oven and cook the onions slowly until tender and translucent. Add the reserved marinade. When the liquid is thoroughly heated, add the chicken pieces, pricked chile, olives, carrots, and water. Stir to mix well, then bring the yassa slowly to a boil. Lower the heat and simmer, covered, for about 30 minutes, or until the chicken is cooked through. Serve over hot rice. If habanero peppers aren't available (or you don't want to burn off your taste buds), serrano, jalepeno, or thai chili peppers can be used. Remove the ribs and seeds of each pepper to reduce the heat of the dish. Taking the pepper(s) out of the marinade before cooking controls the head of the final dish as well. You can use chicken breasts, legs or wings to make this recipe easier and to cut down your cooking time. Alternatively, the chicken (be it fryer pieces, legs, or breasts) can be cooked on the stove top in a large skillet or on the grill to produce a charred outside. Use bagged baby carrots in place of whole carrots. For additional flavor, the 1/2 cup water can be substituted with chicken stock, white wine, olive brine. Cheebujen (pronounced chee-boo-jen) is the national dish of Senegal. Typically a dish of fried crispy fish stewed in a tomato sauce full of starchy root vegetables and rice, it can be followed with fresh fruit and bissop (bee-sop) the national drink of Senegal. I enjoy fried fish just like the next man, but to cut down on fat & calories, I stuffed and baked the fish prior to braising it with the vegetables. The fish is also typically served whole, head and all. Don't be scared. You don't have to eat that part. But it looks pretty in the picture, doesn't it? Make large slits in the side of the fish and stuff with the blended mixture. In a 450 degree oven, bake fish until golden (approximately 10 minutes per inch of thickness, flipping halfway through). Set aside. In a bowl, mix tomato paste, chopped onion, tamarind, and a pinch of salt and oil. Add to 5 quart dutch oven or large pot and let simmer 5 minutes. Add fish back to pot. Add 4 cups water, rice, all vegetables and bring to boil. Let it cook until vegetable are tender. Remove fish and vegetables and place on a serving tray. 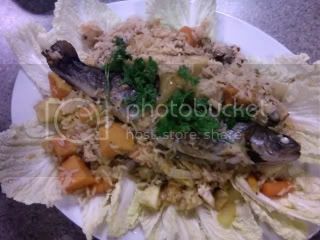 Add rice to tray with fish and vegetables . Alright now - I see you! I see you!